Remote has been tested for functionality. Batteries are not included. Compatible with the DT150, DT250, DT250A, DT502A, AP14 digital converter boxes This is a genuine Apex (OEM) remote control. It comes with two fresh batteries as well as the battery cover, and it has been tested to ensure proper function. All of our remotes are cleaned and sanitized. The item is used, so it will have some scuffs on it; however, it does not interfere the working condition of the remote. Be careful when buying remotes online. If it does not have the brand name on them, it is most likely a knock off remote. Also, please make sure that the number on the remote matches with the listing. APEX DIGITAL DT250RM Converter Box Remote Control DT502A, DT504, E321343 . Condition is Used. Shipped with USPS First Class Package. Apex STBDT250 Digital TV Tuner Converter Box Remote Control for DT250 DR504. Condition is Used. Shipped with USPS First Class Package. Originally Supplied with APEX Models Putting batteries in and Works. Apex Digital TV Converter Box DT250A w/Remote Control . Condition is Used. Shipped with USPS Priority Mail. Manufacturer ID:LR03. Battery Cover Included! As with all used remotes, there could be minor scuffing due to use. Trending at $13.07eBay determines this price through a machine learned model of the product's sale prices within the last 90 days. LE1912 LE1912D LE2412 LE2412D LD2D8RM LE1910. 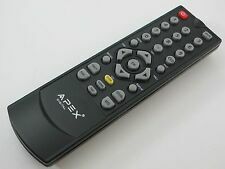 This remote compatible with following APEX TV Models. ITEM IS NEW IN ORIGINAL BOX. Free one year warranty on all remotes. All remotes sold have the battery covers for them. Batteries are included as shown. Converter box is in good working condition - the remote is in good working condition (will require AAA batteries) - the remote does have a couple of marks on the bottom of it near the APEX lettering but does not affect the remote use. This is one of the very few universal remote for converter boxes. you can program your converter box and your TV with this remote to use one remote only. RCA UNIVERSAL DIGITAL CONVERTER BOXES. This universal remote will work with the following converter boxes. Compatible with APEX DT150 DT250 DT250A DT502A DT502 TV Tuner Converter Box. Apex Digital TV Tuner Converter Box Remote for. Trending at $21.74eBay determines this price through a machine learned model of the product's sale prices within the last 90 days. What you see is the exact item you will be receiving. For DT150 DT250 DT250A DT502A DT502. BATTERY COVER INCLUDED! Originally supplied with models. New!! APEX DIGITAL TV CONVERTER BOX W/ Analog Pass Through #DT250A & REMOTE!! With more features than most digital TV boxes, the DT Series is ready for the future right now. Connect to a Smart antenna for improved terrestrial TV reception. Connect to S-Video output for maximum picture clarity. 4.5 out of 5 stars - New!! APEX DIGITAL TV CONVERTER BOX W/ Analog Pass Through #DT250A & REMOTE!! 11 product ratings11 product ratings - New!! APEX DIGITAL TV CONVERTER BOX W/ Analog Pass Through #DT250A & REMOTE! !